Smoke-free outdoor spaces keep our air clean and protect public health. Secondhand smoke can be as just as dangerous to breathe outdoors as indoors. Tobacco litter is also toxic and not biodegradable. Additionally, tobacco-free policies make it easier for tobacco users to quit or cut back and denormalize tobacco use. For worksites, evidence has shown that smoke-free grounds are associated with reduced daily cigarette consumption among employees, and possibly with increased cessation. This can reduce employer health insurance costs and absenteeism rates. Many Champaign County organizations have smoke-free grounds. We would like to thank these organizations for protecting public health. 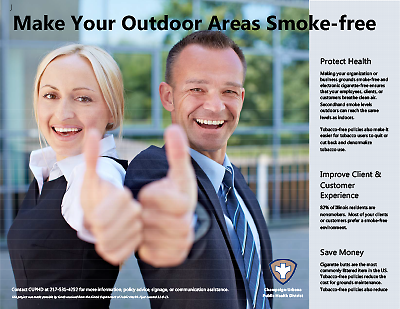 Our sample tobacco free policy provides guidelines an organization can follow to go smoke-free outdoors. Contact us at tshaw@c-uphd.org for assistance with policy development or for more information. Champaign County Forest Preserves: All facilities (including pavilions), playgrounds and playscapes (plus 50 feet), and Par 3 golf course. Includes e-cigarettes. Ludlow: Completely tobacco-free parks, including e-cigarettes. Mahomet: Tobacco-free park recreation events and facilities, including playgrounds, ball fields, and pavilions. Ogden: Completely tobacco-free parks, including e-cigarettes. Rantoul: Playgrounds (plus 50 feet), Wabash Park baseball fields and bleachers. Sidney: Park baseball fields and concession stands. Tolono: Village has a completely smoke-free park ordinance. Urbana: The Dog Park and Crystal Lake Park labyrinth. Evidence has shown that smoke-free policies in the workplace are associated with reduced daily cigarette consumption among employees, and possibly with increased cessation.